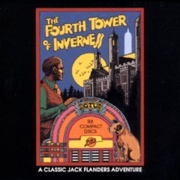 When The Fourth Tower of Inverness first aired on radio in the fall of 1972, it was released as a daily series, Monday thru Friday (65 episodes, about 7 mins each). The Daily Radio Version we are offering here differs from the CD version in that it contains all the recaps, plus previews of the next day’s episode. The CD Version does have the complete episode, but no previews, and only an occasional recap, so the story flows from one episode to the next. Fourth Tower of Inverness was a wonderful, imaginative adventure. I wasn’t a huge fan of all the 50’s music, but then again, what kind of music would you expect from the jukebox? The viewing of past lives and the explanation of the Tibetan Wheel of Life were both very interesting. The storyline had some overly silly parts, but overall the humor was indeed humorous. There was also an enjoyable spirituality to the 4th Tower. If you are a first time/potential buyer, do not hesitate to grab the Fourth Tower of Inverness. . .